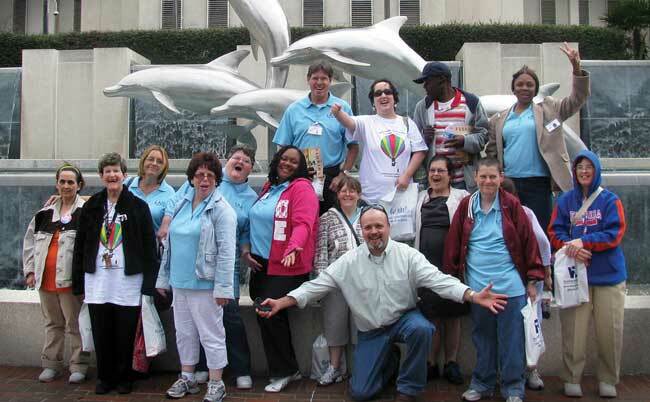 Adult Day programs offer an opportunity for individuals to acquire and improve skills which will empower them to access activities and relationships of their choice. The Adult Day Training (ADT) program offers individuals opportunities for work, education, community integration, recreation and socialization. Our training staff works closely with individuals to foster independence and train them in skills needed for work in the community or our onsite workshop. We have a variety of work contracts and are able to offer employees options in the type of work they do. We specialize in collating, packaging and assembly. Staff to consumer ratio ranges from 1:1 to 1:10 depending on the consumer's needs and the activity. Ongoing training is provided by our staff and through Adult Basic Education classes. Services are available four to six hours per day. In order to increase the skills necessary for independence and develop each individual's unique gifts, we offer Adult Basic Education classes through the Alachua County School Board. Consumers can choose classes based on their interests or needs. Classes offered include cooking, math skills, reading and writing, safety, self-care skills, and arts and crafts. The goal of ABE is to provide consumers with the skills necessary for successful daily living. Areas of training include maintaining appropriate behaviors in the community and teaching skills that support independence. Individuals also have the opportunity to explore leisure and recreational activities in the community such as bowling, fishing and swimming.